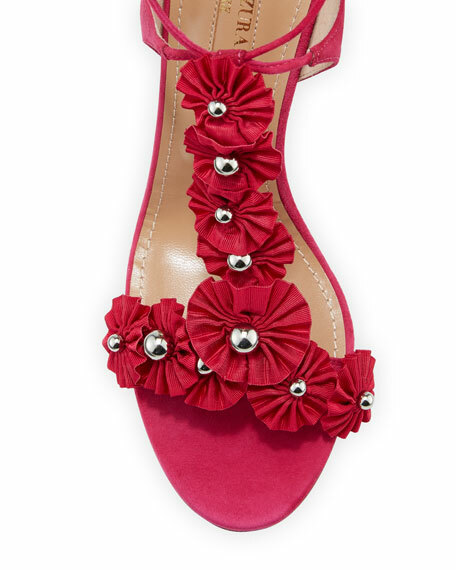 Aquazzura suede sandal with studded grosgrain appliques. For in-store inquiries, use sku #2344958. Christian Louboutin kidskin leather sandal. 5.1" covered stiletto heel with platform. Wide strap bands open toe. d'Orsay silhouette. Crisscross strappy vamp. Adjustable ankle strap. Padded footbed. Signature red outsole. Made in Italy. Giuseppe Zanotti suede sandals with mixed Swarovski crystal circles. 4.5" covered stiletto heel. Strap bands open toe. Adjustable ankle strap. Leather lining and sole. Made in Italy.